Fort William is the Outdoor Capital of the UK. 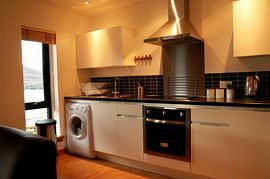 Our self catering apartments offer ideal facilities 5 minutes walk from the pubs, restaurants and amenities of Fort William town centre. 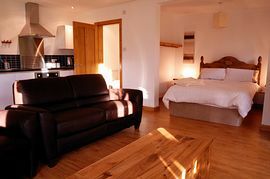 The apartments provide the perfect base for exploring the west coast of Scotland. Be it you are an out door enthusiast or simply want to take in the sights of this beautiful area. 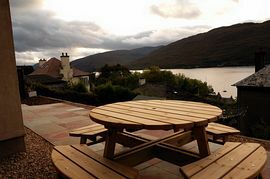 Elevated views over Loch Linnhe. 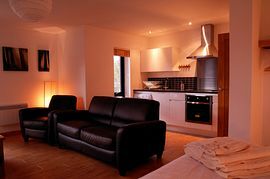 Duachy apartments are a 5 minute walk from the town centre. Pets allowed in the Cedar apartment by prior arrangement with the owner. Terraced area with picnic table and seating. Local Services: Local services are a 5 minute walk from the apartments. From the round about at the West end of Fort William Highstreet, take the turning uphill on Lundavra Road. Argyll road is the second road junction on the left. Take the junction at Argyll road and carry on up Argyll Rd for 250m to Duachy Apartments. 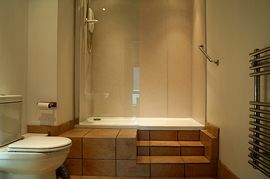 Prices range from £240.00 to £450.00 per week.